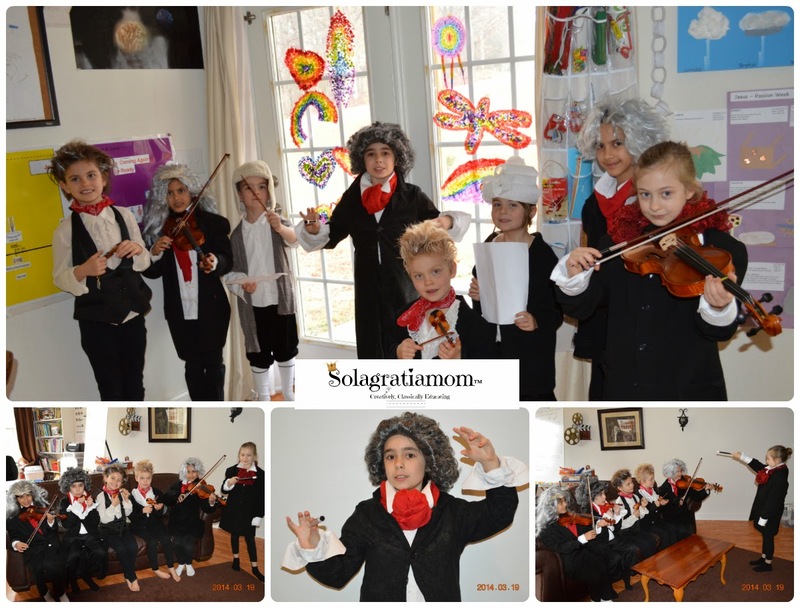 This week we decided to dress up as Beethoven from our Fine Art, Composer studies. I loved the variety and versions we got of Beethoven. It's so fun to see the kids when they are dressed up and given some free time, we often will see them acting out their character! How great is it to see their minds exploring the character, time period and actions of that person's life - all on their own, based on what they have learned in class and home this year, regarding Beethoven? That's why I love what I do! We began our day as we always do, lapbooking away at the week's memory work and at the end of that time, we had a special treat, as one of the girls brought her violin and played for us all. 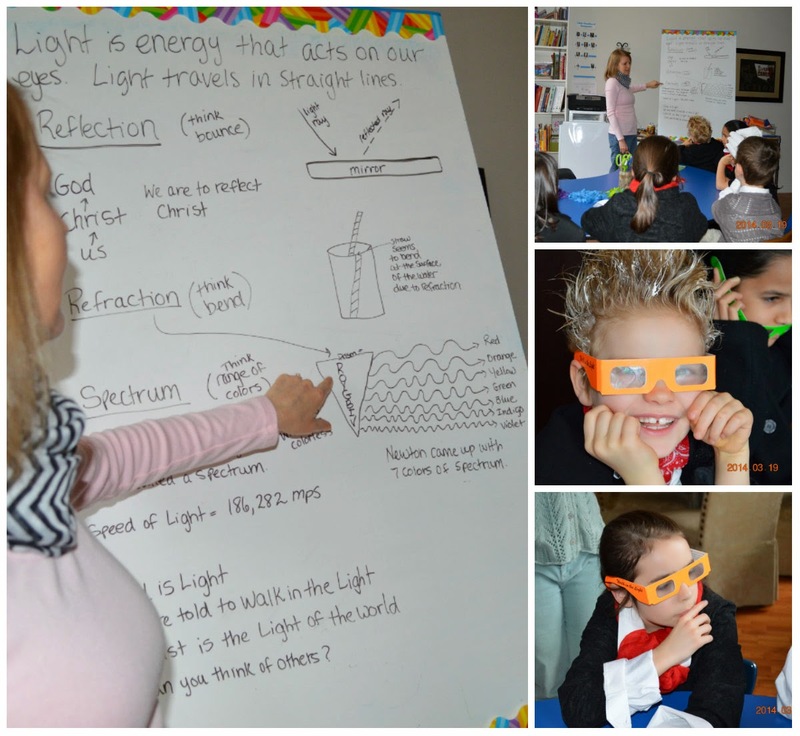 We focused our project on the concepts for science regarding light - reflection, refraction and spectrum. Like always, we are not trying to get the kids to "understand" at this age and "teach" these concepts -but rather, give them exposure; exploring the concepts through fun experiments or demonstration and provide some context for the memory work, the world in which they live and the God we serve. So the first thing we did, was define the grammar. I just gave them a simple "kid words picture" for each of those concepts. Reflection I said "think bounce", Refraction I said "think bend" and Spectrum I said "think rainbow". I also tied the Light of the World - Jesus -into our discussion of light. We talked about what the Bible teaches us about Light and the number of references to it, we can find. One concept that I thought was neat, that one of our bright Momma's brought out on this topic, was the concept that darkness can not overcome light. I love how God gives us earthly, concrete examples of heavenly Truths. I had acquired some prism glasses from a retreat I went on back in October, that I have been saving for just this day! So I had the kids put them on and they were able to see the full spectrum of light. We talked about the acronym ROY G BIV and what each color was represented by the letter. 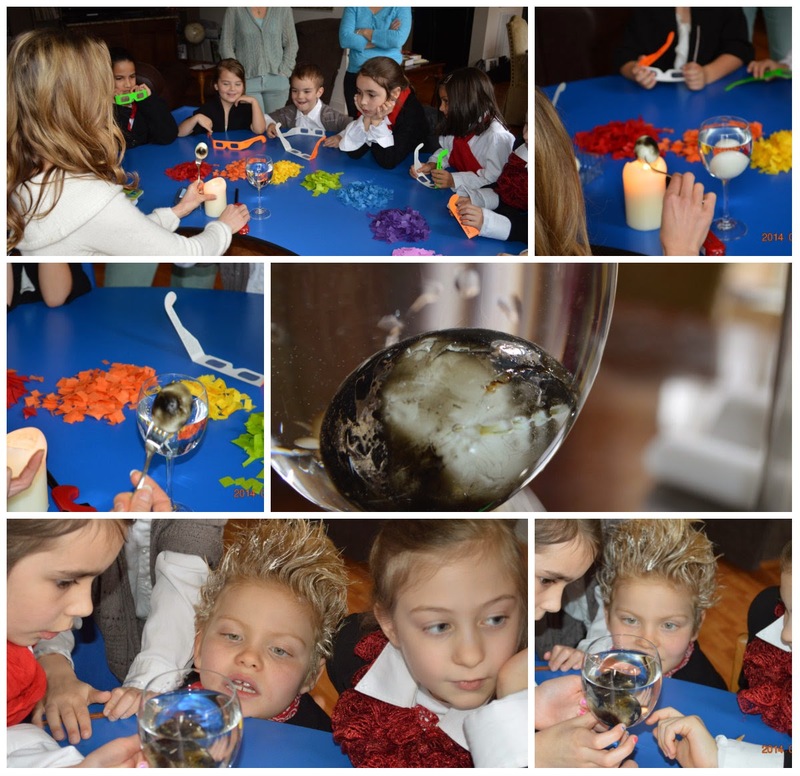 The first demonstration we did was to take two hard boiled eggs, a glass filled with water, a candle, lighter and fork. We had the kids drop a hard boiled egg into the water and see if it reflected. Of course, it did not. Next we took another hard boiled egg and heated it over a flame till it was black. Then stuck it in the water. The carbon on the egg "reflected" off the egg! It was pretty neat! The next thing we did requires a bowl, water, tape and a penny. We first taped the penny to the bottom of each bowl. Next we had the kids look at the penny and then walk backwards just until it disappeared from their sight. Once they were in position, I poured water into their bowl as they watched. 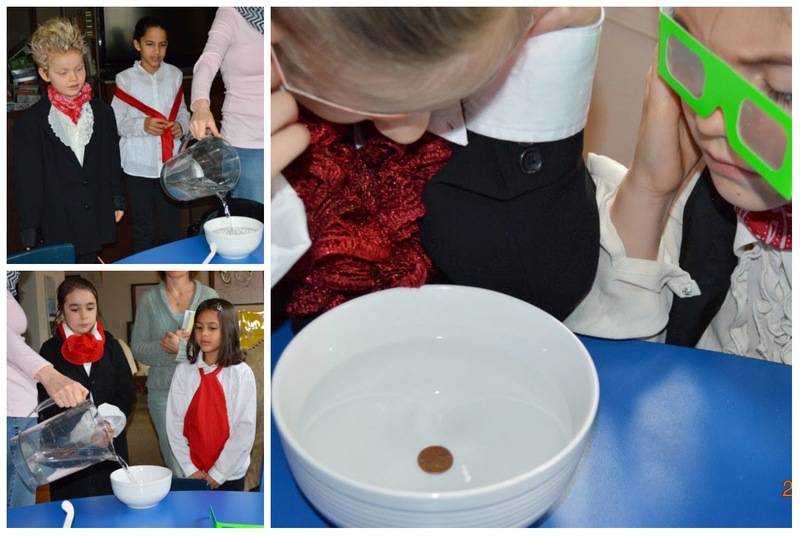 The penny "magically" appeared and was able to be seen as if it was at the surface of the bowl. The next demonstration we did was to take note cards and write large arrows on them and then we took various size/shaped containers to fill with water. 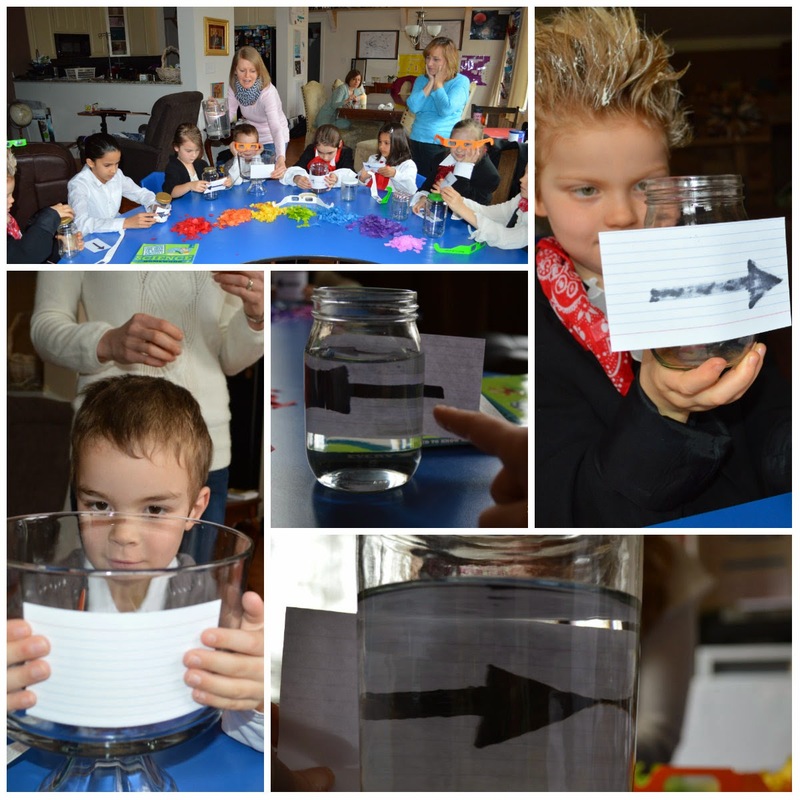 The kids viewed the arrow once the water was put in their container and it "magically" appeared to change directions. 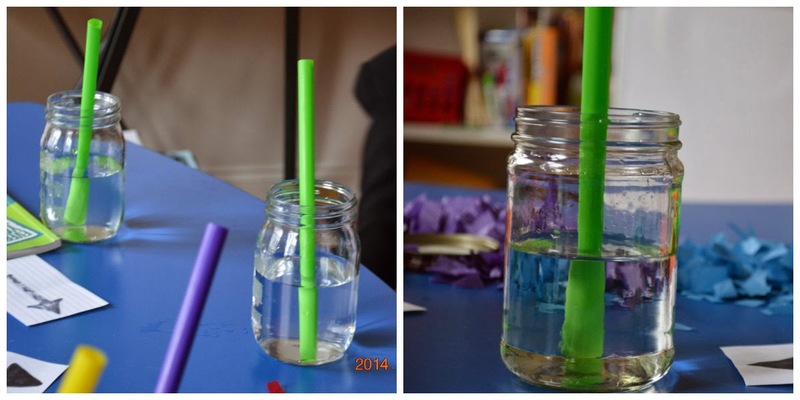 Straws inside a jar filled with water - a great and easy way to show light refraction. 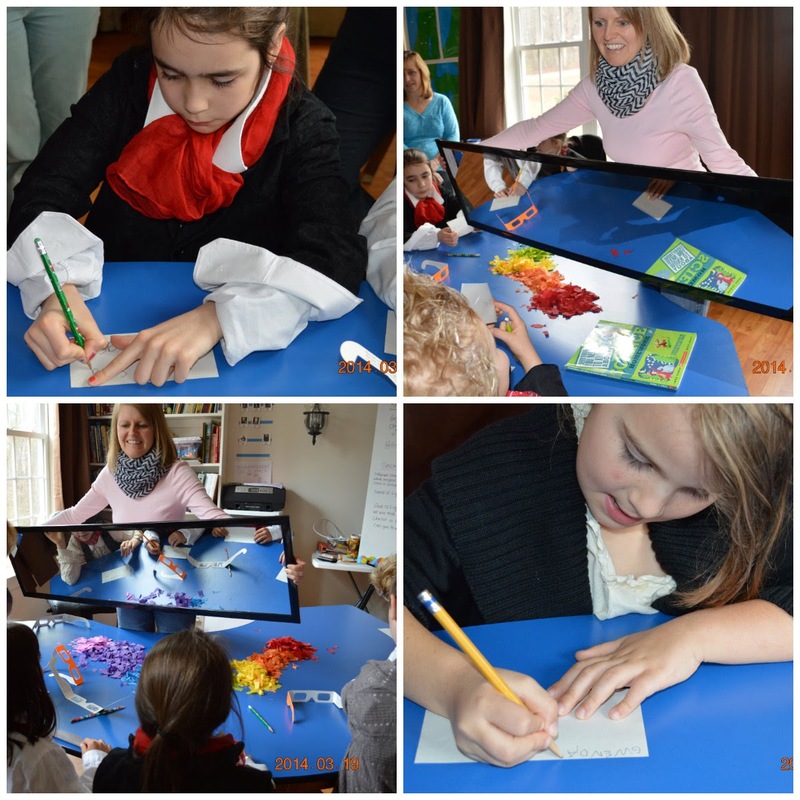 Next we had the kids write on note cards and then I brought a mirror around and they looked into it to see what happened to their letters in the mirror - they were backwards! 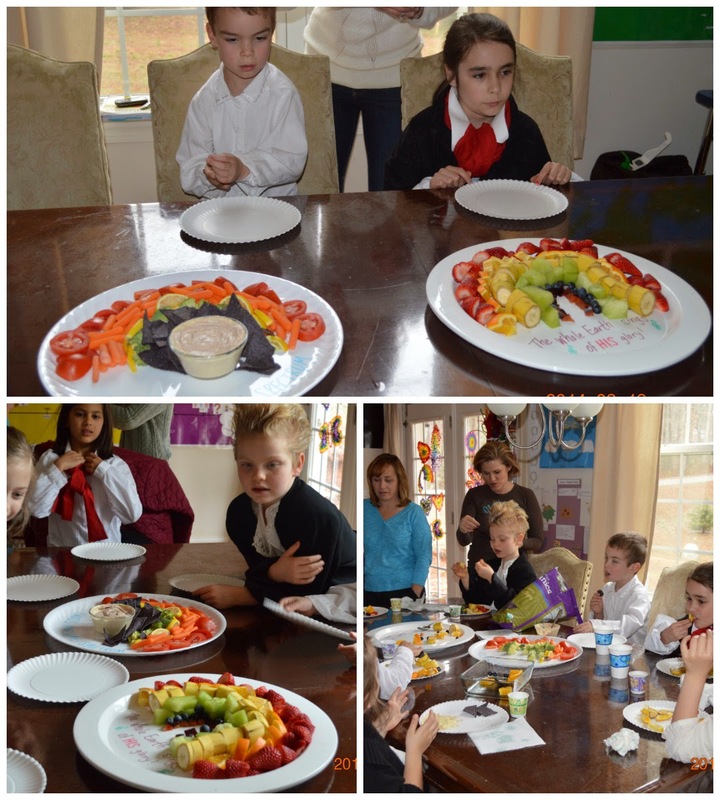 We did an experiment to end, before we began our projects. We took a piece of newsprint and then explored how the print changed, as we looked at it with magnifying glasses and then plastic wrap with water drops on it. The water and the magnifying glass changed the way our eyes saw the print size. All these various demonstrations above, showed the kids how refraction and reflection affect the way our eyes see things. Our last thing was to begin our projects! The project was on the spectrum. 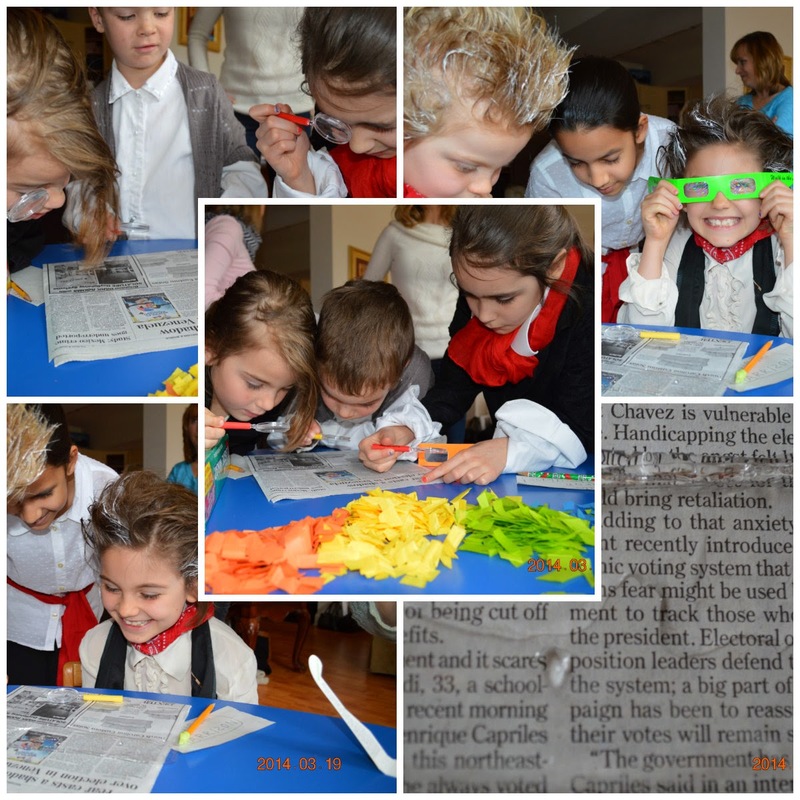 We had already talked about good ol' ROY G BIV and then we tied the seven colors of the rainbow, with that famous guy we dressed up like and learned about a few weeks back - Newton! It was Newton who named the seven colors of the rainbow. Red, orange, yellow, green, blue, indigo and violet tissue paper cut into small squares. 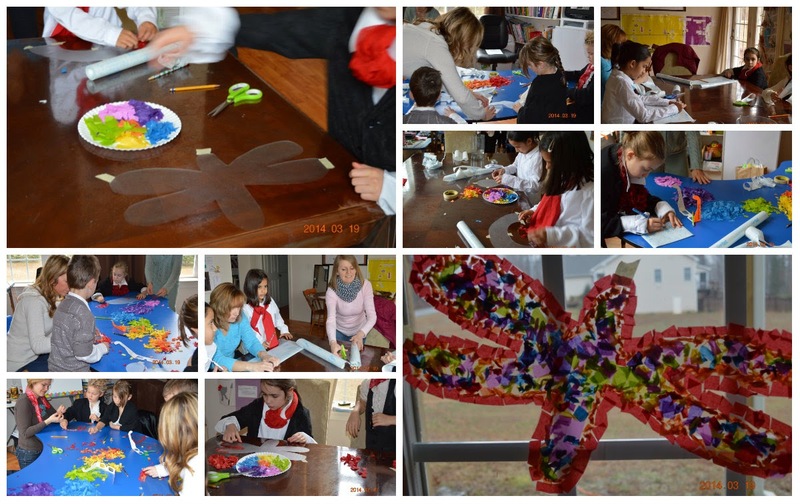 First the kids were each given a rectangle of contact paper to draw a design on and cut out. Then they peeled back the backing and laid the contact paper sticky side up on the table and taped the edges down to the table, so that it wouldn't move as they worked. Next they began to add their colors from the rainbow, by either crumpling up the tissue paper squares or laying them flat and sticking them on their contact paper to make their design come to life. In the end, they had pretty sun catchers that showed the colors of the rainbow! The snack was as beautiful as the rainbow! 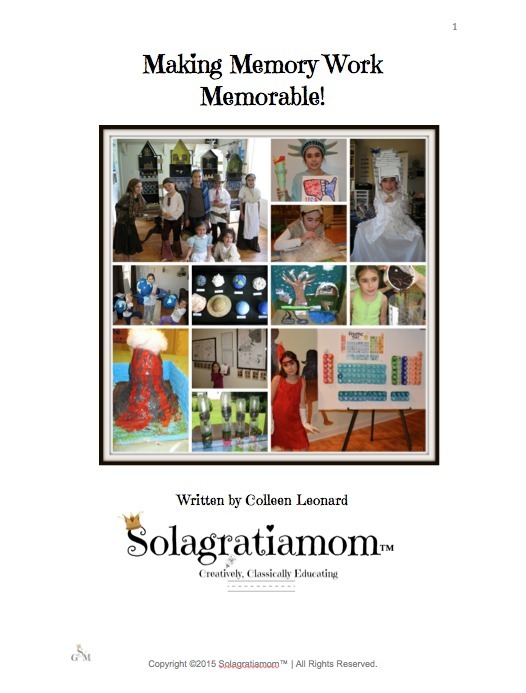 Love these creative Mommy's! Yum! Those dragon flies are beautiful! Your school always looks so engaging. Love it all! Thank you Melissa! I appreciate your stopping by! I always get a kick out of your kids' latest costumes! The little blonde guy's hair cracks me up. I wish we lived close enough to join your group. It looks like loads of fun and learning. It's good to see the healthy rainbow snacks! I get a kick out of seeing the kids each week too! I'm not sure who likes the dressing up more - the kids doing it or us adults admiring our kiddo's in their creations! LOL Have a great weekend! That looks like a fun group. What a blessing to have a group like that.